During the two decades of my marathon battle with cancer, I had to learn to fight back. And I learned that the best weapon I have is giving back. Join me in helping others who are battling cancer and other life-threatening diseases. 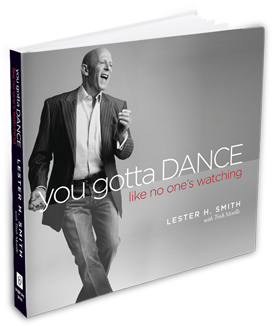 Your purchase of this copy of You Gotta Dance Like No One’s Watching supports breast cancer and genomic research worldwide. Or, as I always say, “Think big!” Purchase a dozen books and give them away, so more people will be aware of this opportunity to support this life saving cause. I’ve learned—sometimes the hard way—that in the end, that’s what it’s all about: giving whatever we can give to make a positive difference in the life of others. Now, I want to make it easy for you to join hands with us as we give back to fight back. Pay it forward! Born in Wharton, Texas, Lester Smith struck oil for the first time on his seventh birthday. Since that time, he has proven that he has such a nose for crude, he has been compared to a truffling pig—and worse.